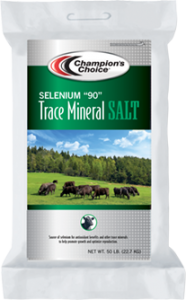 A fine-screened selenium salt block or bagged product specially formulated with trace minerals to help meet the requirements of beef cattle. The trace minerals complement the diet to help promote digestion, growth, maintenance of body tissues, proper reproductive processes, and general animal well-being. Selenium is added as a supplement for use in selenium-deficient areas. 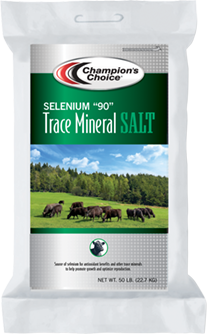 Selenium “90” trace mineral salt blocks are weather resistant for free choice feeding. Feed this supplement free-choice to beef cattle as their only source of supplemental selenium. Limit feed if consumption exceeds 1.16 ounces per day. 1.16 ounces of this supplement will supply 3 milligrams of selenium. Salt, Zinc Oxide, Iron Carbonate, Calcium Carbonate, Manganous Oxide, Copper Sulfate, Yellow Iron Oxide, Mineral Oil, Calcium Iodate, Cobalt Carbonate, Sodium Selenite, FD&C Blue #1 Lake and Anise Flavor.